Coach Tony Lambert knew Steamboat would be tough. Prior to the start of the season he predicted four teams, including the Blades, would have a legitimate shot at the title and Steamboat is one of them. In fact he even admitted, going into the weekend, that he was hoping to come back with at least one win, if they were lucky. 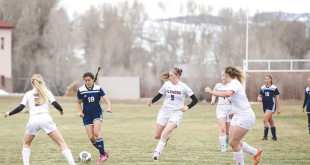 Practices leading up to Steamboat were solid and Izzie Dethloff was back from injury but the team is still struggling with putting all of the pieces together. The Blades appeared to have shaken off the mid-season slump in their first game against Steamboat on Saturday, January 30. The Blades set the tone for the game outhustling and outshooting Steamboat but Steamboat’s goalie was top notch in net turning away the Blades’ shots throughout the first and second period. Steamboat broke the scoreless tie 14 minutes into the second period when a Steamboat player pushed the puck through during a mad scramble in front of the Blades net. “There must have been eight, maybe nine, people in the crease and they just managed to lift one up and put it in,” says Lambert. The Blades continued to push and while shots weren’t getting through and frustration was mounting, they continued to work hard. 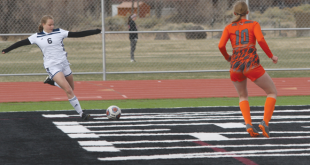 Their effort paid off in the 12th minute of the third period as Sierra D’Aquila scored off an assist from Bryar Robbins and Jaden Cavarra to tie the game. Anika Anderson was equally strong in net for the Blades and the two teams finished with a 1-1 tie. The same can be said for the second game against Steamboat on Sunday, January 31, except for the end result. The Blades outshot Steamboat 27-13 through three periods but another pile up in front of the Blades net resulted in another Steamboat goal. Unfortunately, the Blades were never able to find a seam past Steamboat’s goalie as they fell 1-0. The Blades will need everything they got this weekend when the host Aspen in Gunnison on Saturday, February 6 at 5 p.m. and then again on Sunday, February 7 at 10:30 a.m.